The western look is a little popular & today's wardrobe inspiration shows you how to take on the trend but in a chicer way. Check out & shop this look for inspiration. 1. COACH penguin print blouse, available at FARFETCH. 2. CHLOE 'Pixie' large suede & textured leather shoulder bag, available at NET-A-PORTER. 3. STUART WEITZMAN 'Camila' white leather mules, available at FARFETCH. 4. LORD & TAYLOR gold hoop earrings, available at LORD & TAYLOR. 5. BLOOMINGDALE'S gold horn pendant necklace, on sale at BLOOMINGDALE'S. 6. 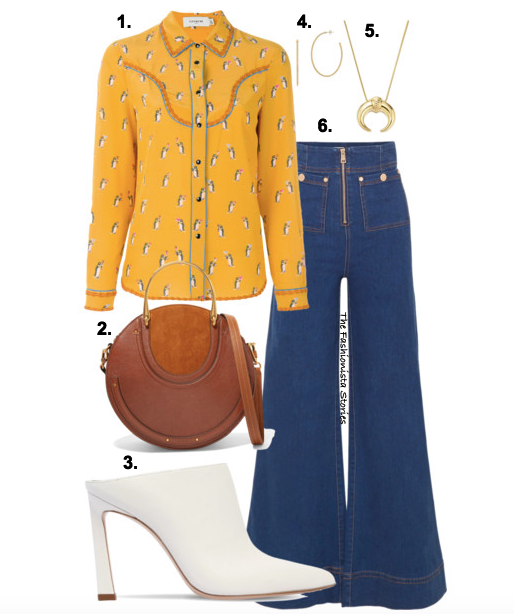 ALICE MCCALL 'Bluesy' high-rise wide leg jeans, available at NET-A-PORTER.